Full-colour portrait of your character. Starting price (1 character) = 500 points or 5$. Extra characters: +300 points each. Full-colour painting of your character. Starting price (1 character) = 600 points or 6$. 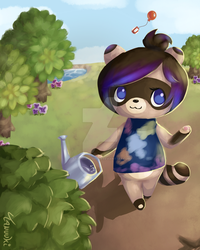 Full-colour painting of your character as a chibi. Starting price (1 character) = 500 points or 5$. Black and white portrait of your character. Keep in mind that I will need a description or reference of the facial structure you want the character to have. Starting price (including 1 character): 300 points or 3$. StuffedPolarFox has started a donation pool! A huge update + Am I back? I've been gone from here for quite some time without letting you know, a lot has changed and my life has been quite hectic for the last 2 months or so. As for university, I study biology now and it's been quite tough. At the moment I have practicals for the upcoming 2 weeks, which leave me with very little spare time. In addition to that, I broke up with my bf. I'd been considering to do it for a long time, but I never had the guts to actually do it. So now I finally did it, and gave myself a hard time.